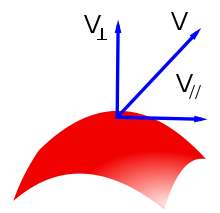 In mathematics, given a vector at a point on a curve, that vector can be decomposed uniquely as a sum of two vectors, one tangent to the curve, called the tangential component of the vector, and another one perpendicular to the curve, called the normal component of the vector. Similarly a vector at a point on a surface can be broken down the same way. More generally, given a submanifold N of a manifold M, and a vector in the tangent space to M at a point of N, it can be decomposed into the component tangent to N and the component normal to N.
where the first vector in the sum is the tangential component and the second one is the normal component. It follows immediately that these two vectors are perpendicular to each other.
" denotes the cross product. used (there exist two unit normals to any surface at a given point, pointing in opposite directions, so one of the unit normals is the negative of the other one). Suppose N is given by non-degenerate equations. If N is given explicitly, via parametric equations (such as a parametric curve), then the derivative gives a spanning set for the tangent bundle (it's a basis if and only if the parametrization is an immersion). In both cases, we can again compute using the dot product; the cross product is special to 3 dimensions though. Lagrange multipliers : constrained critical points are where the tangential component of the total derivative vanish. Rojansky, Vladimir (1979). Electromagnetic fields and waves. New York: Dover Publications. ISBN 0-486-63834-0. Benjamin Crowell (2003) Light and Matter. (online version).